The spirit of commercial competition is alive and well in Africa. The proof is all around. I recently saw a little general store called ‘God is GREAT’. The next-door neighbour had set up in direct competition, with an identical store full of identical stock. ‘God is EXCELLENT” read the luridly emblazoned letters above his door. Others hope to find blessing for their business closer to home. ‘Daddy’s Cool’ read the slogan on the front of a battered matatu (minibus) that we saw on the Mombasa road today. As it shot past us I just had time to read the slogan on the rear: ‘Mama Says I’m Special’. It was designed to be touchingly thought-provoking perhaps, but not so much as another bus we saw farther south that carried an intriguing claim on the back: ‘I have a father and he knows my name’. Catchphrases are written on every flat panel of the matatus and buses here in Kenya and even the massively potbellied baobab trees serve as rural billboards. 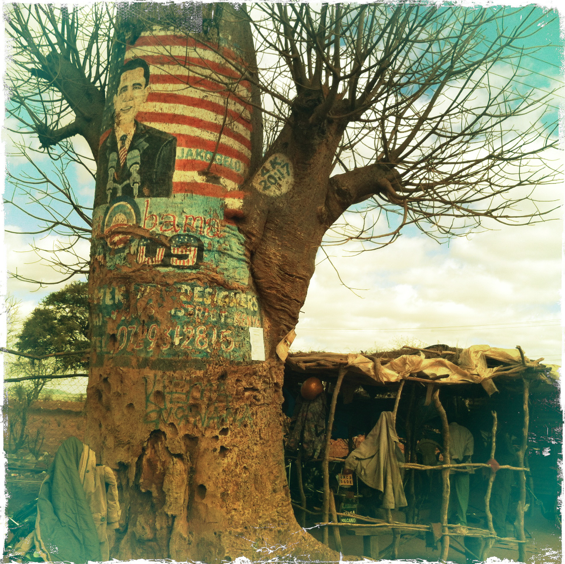 The exaggeratedly benevolent portrait of an oversized Barack Obama smiles down from the great flank of the baobab that serves as a market-town bus-stop. A battered bus creaks to a stop, tortured brakes squealing in protest; ‘Who Let the Dogs Out! !’ screams the slogan on its back end. Sometimes the messages are pure bravado. One kid wears a teaching boasting that ‘Nobody in my City has Swagger Like Me’. He is running to catch a matatu called ‘Bust it Baby’. Other times they might just be trying to evoke an air of mystery. ‘The Story Has Never Been Told’ I read on the flank of one matatu, and ‘Dancing Elephant’ I see on the back of another. ‘NYPD’ says one. ‘Surprise Doctor’ another. Maybe it’s a private joke or a play on words. The Swahili word for car is ´gare´ (pronounced ‘gahrey’) which might explain the matatus we’ve seen called ‘Jim Carey’ and ‘Mariah Carey’. Sometimes the old-time diesels and dukas (stores) are just tipping their hats to a modern era that seems to be leaving them behind in the dust. Near the town of Emali we passed the Facebook Bar and somewhere down the road from the Dotcom General Store we were overtaken by a bus called ‘My Space’. At other times you wonder if it’s just a heartfelt cry to be somewhere else. Anywhere else. Do the owners of the Miami Beer Garden, The Paris Bar, The Amsterdam Massage Parlour really want to be in Miami/Paris/Amsterdam rather than Kafili, Kenya? Probably. But does the owner of the ‘Florida County Bar’ even realize that Florida is a state? Some small towns are inexplicably overloaded with religious establishments of all sorts and graffiti-ed with roadside signs advertising the spiritual benefits of devotion to ‘The Oasis Baptists Congregation’, ‘Kingdom of Jehovah’s Witnesses’ or ‘Holy Smoke Catholic Chapel’. “So much bad advertising,” says our taxi driver Richard Chai as we drive down the slip-road to the Mombasa ferry. A one-legged drinks vendor hops towards the car to greet us. “Jambo. How are you?” I ask as I buy a bottle of spicy Stoney Tangawezi. “Fine!” he beams. Kindred spirits ! I love to read the taxi graffiti + the signs in rural villages, of which there are plenty in KZN . Thanks Mark ! Ghana is the worst for religious titles and litteraly every commercial establishment is related to the entity upstairs. In Uganda, there is an endearing idiosyncrasy whereby a lot of rural people pronounse R as L, and it gets even harder to keep a straight face when they do it in writing as well… Bless the Lold anyone?